Published November 11, 2011 By Anna T. This post may contain affiliate links. Regardless, I only recommend sites I've researched and/or used and trust. A Closer Look is a very reputable mystery shopping company. They've been around since 1994 and while they do offer retail mystery shops, they also tend to have a lot of restaurant shops (free meal for you!) and motel shops (a free night away from home!). The feedback on this particular company is mostly positive, so if you are either interested in or enjoy doing mystery shopping, this is one to consider. In general, mystery shopping work does not pay well enough for it to be considered a full-time job, but I have heard of people making anywhere from an extra $100 to $400 per month (and probably even more than that) just for doing shops regularly. If you sign up with as many companies as possible and take as many shops as you have time to do, you would be surprised at the extra money you can earn as a mystery shopper. 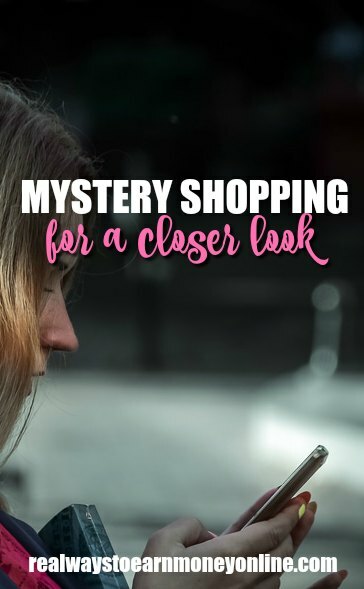 If you want more details on how mystery shopping works before checking out A Closer Look, read this mystery shopping article one of my readers contributed. How much does A Closer Look pay for mystery shopping? The amount varies. If you take a shop, you'll be told beforehand how much you'll get for doing the shop as well as how much they will reimburse you on what you spend. You have to either take a picture of or scan your receipt and upload it to them in order to get your reimbursement amount. A Closer Look will only reimburse you up to a certain amount. So if you go to a restaurant and spend $70 on food, including tip, and A Closer Look says they will reimburse $50 for that particular shop, you're out the other $20. A Closer Look posts all available shops on their website during the last week or so of the month. You can log on then and see if there is anything in your area you think you can do. If you see something you want to do, grab it. If a true emergency comes up and you can't go, you should contact A Closer Look to let them know so they can find someone else. A lot of mystery shopping newbies do not take the job seriously and do this all the time, and this causes problems for the companies. In addition to finding shops on their website, you might occasionally get emails letting you know if there is something in your area. When does payment come in? A Closer Look pays once a month for shops you've completed on every 3rd Friday of each month. You get your payments for shops you do one month after you've done them. According to the A Closer Look website, you receive paper checks as payment. To apply to be a mystery shopper for A Closer Look, you have to be at least 18 years old. You must also take and pass a pre-qualification test that will help them determine how good you are at following directions and your attention to detail. Much of this test is written, so be very careful about spelling/grammatical errors because this is something they will notice. Good writing skills are key to mystery shopping success. This is because sometimes you must write descriptive narratives of your shopping experiences. What do people say about A Closer Look? I found lots of information on the company here at volition.com and as you can see for yourself, the feedback is very positive. They pay on time and most people enjoy doing shops for the company. Please keep in mind that this thread on Volition goes on for several pages and the comments at the beginning are as old as 2004! But there are more recent comments. If you live in a fairly rural area, you may not get that many opportunities for mystery shopping that don't not require you to drive a good distance away. The more shops and businesses (particularly chains) you have in your area, the more likely you are to find shops you can do often. This doesn't mean you shouldn't still sign up, but it does mean that you may not be able to do shops very frequently unless you are willing to do a lot of driving. One company I reviewed, Marketforce, sometimes has local shops. They have a lot of McDonald's shops available and chances are good that you have one of those close by. Go here to sign up and do mystery shopping for A Closer Look. it’s mainly reimbursement only shops. Some you even have to pay for and get paid back with a gift card. The requirements are sometimes too much for too little pay. They used to be a good company. The schedulers are very good and easy to work with. Some of the editors are not very good to deal with. They mess with your checks, lie about ever sending them, ironically the checks they sent the first time have never once been returned back to them but the alleged “replacement” checks always are received and you have waited and additional months waiting to get paid. Then after I called them out on their 🐂💩, I get unceremoniously deactivated without the professional courtesy of notice and I had to hear it from a scheduler who I consider very dear to me while I was asking her to change my due date on a couple of shops because of some emergencies that came up due to trying to help some family and ext family victimized by the fires that are going on. I am good. On them. I have never flaked. I did my own work and took my own pictures. I always stayed I contact with my schedulers. I am a seasoned shopper with over 20 years of experience. I am good on this. They don’t deserve the award of top company. I know companies I have been with since I became a shopper that deserve that recognition and distinction more than these people. Dont sign up or do any shops for them. You set yourself up for failure later. I got accepted into their company! I said you recommended me! Thank you.